CDXC Members Gordon, G3USR and Tom, GM4FDM together with four other Dutch amateurs will be QRV from the Island of Jersey beginning Tuesday June 29th for 6 days. We plan to be on 160 through 6 metres with full legal power and up to 5 concurrent stations. With just 6 ops this will be quite a challenge!! The predominant band focus will be 6 metres - hopefully this operation will give many a new IOTA on 50 Mhz and well as filling any other needed band slots for many stations. The location will be the operating club site of the Jersey Amateur Radio Club and full details including call signs and other info are available on the DXpedition web site at Jesey website Please take a look. We will be having fun - please join us for a QSO or two! FSDXA - Yagis and Masts for sale! FSDXA is "going vertical" and selling some of its Yagis and masts. See "For Sale" pages. Contester required for IOTA Weekend! M8C are looking for an extra contester for the RSGB IOTA Contest 2010 from EU-011 St Marys Island, Isles of Scilly. The applicant needs to be available from 19th July till 26th July (camping) ferry £95 return. transport from London available. At the moment the archive covers the years 2003 to 2009, with more PDFs and older scans from the 1990s and 1980s planned for inclusion soon. John, 9M6XRO, and Steve 9M6DXX were unable to operate from Sebatik Island, OC-295, on this occasion, but we have been able to make arrangements for a 4-day DXpedition there in September. Further details to follow. M0AEP Graham will be in Montserrat (Locator FK86vr / IOTA NA 103) for 4 weeks commencing 13th June. Hope to find time, especially in last 2 weeks, to re-activate the call sign VP2MDD. 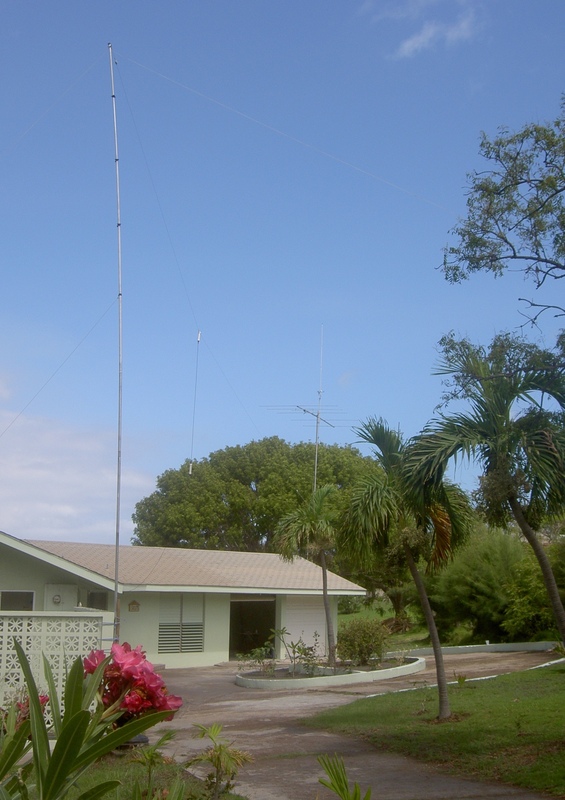 Priority will be 6 metres SSB / CW operation with 5 element yagi & half wave vertical with 200 watts. During 6M dead periods will work 10M / 80M (including 60M) with 200 watts to a Carolina Windom. Will be monitoring internet sites for openings. John, 9M6XRO, and Steve, 9M6DXX, will be visiting Sebatik Island (OC-295) from 3 to 5 June and may be active as 9M6XRO/P (CW) and 9M6DXX/P (SSB) using 100W to a simple wire antenna, although no operation is guaranteed on this occasion. The visit is in preparation for a possible DXpedition there later in the year with higher power and better antennas. OC-295 has only been activated once before, in July 2006, and remains high up the IOTA 'Most Wanted' list. QSL both callsigns via M0URX, direct, bureau or LoTW. independent of us, we are not able to carry out the expedition. On the 25th of May at 10 p.m. local time the engine of our ship “Southern Cross” fell out, when we were in 120 nm from Kanton Island. The captain Paul Green decided to turn the ship and go back to the port of Apia, Samoa under sails. Such decision was determined by the fact that the entry to the Kanton`s cove without engines would be impossible and the repair of engine in the ocean is impossible too. The way to Apia, Samoa will take approximately 8-10 days with favorable wind under sails. The food and water must suffice.Our main task at the moment is to come back safe to Apia. Chiltern DX Club are sad to learn of the sad loss of K5VT Dr Vinson (Vince) Thompson. Vince passed away after a short illness on Saturday 24th April 2010 aged 67. Vince was well known to many members of CDXC and on behalf of us all at HQ we would like to pass on our condolences to the family and friends of Vince K5VT. R.I.P.